Prepare your pet for the arrival of your newborn coming home can be very simple with these easy steps. Schedule all grooming and veterinary checkups before 37 weeks. Make sure your pet is groomed, nails are clipped, and the animal is in good health prior to the baby coming home. Schedule a dog walker or puppy day care for delivery and the first few days postpartum so that both of you can focus on the baby while knowing your fur baby is safe and sound too. Assess all the pet’s toys and consider removing anything that is similar to a baby toy. Many baby toys are soft like teddy bears are very similar to the dogs favorite soft toy. By removing the similar toys now, you may have less issues with your dog stealing the baby’s teddy bear. Set up and use baby gates now to block off safe areas if needed. For cats consider rolled up tape or aluminum foil for surfaces you do not want the animal laying on such as the crib or changing area. The old wives tale about cats stealing baby’s souls is just that a wives tale. However, I can tell you that a baby will mimic the breathing pattern of the person or animal next to them. So if the cat joins the baby, expect the baby’s breathing pattern to mimic the cat. As well as the baby will get hair in their mouth. For anxiety prone animals or those who are not conforming with the new parameters set up above, see a professional pet trainer. A trainer can work on behavior issues like nibbling, jumping, and other territorial issues. They may suggest playing crying baby sounds to acclimate your pet or releasing pheromones to assist with anxiety. And if you have not already done so, you may consider spaying or neutering your animal prior to birth as it can help to promote calmness as well as reduce health issues. Pre introduce your pet to the baby’s scent. Most birth locations will supply you with a dirty cap or blanket for your animal to sniff. This is especially beneficial as the baby hat will smell like mom, partner, and the new baby. So the pet will begin to understand that the new smell belongs to you, the owner. If your pet is territorial, consider introducing the pet to the baby in a neutral territory such as the driveway or a neighbor’s yard. After you enter in the house isolate the pet with the baby’s hat and then play with the animal to exhaust them. For territorial cats consider a feline diffuser like this one to calm their nerves. Once the animal is tired, reintroduce the baby and pet in the house with supervision. Have distractions or treats ready to either distract or reward the pet. Most importantly, regular routines and exercise is critical for the physical and mental health of your pet. If you are too tired to walk or play with your dog use a dog walker or send your pet to doggy daycare. And never leave your baby and dog unsupervised in the beginning. A crate really is a dogs best friend. Once your baby is mobile, there is another huge shift for the pet as the baby is no longer an isolated event. It moves, it crawls, and it interacts with your pet. Dog food and feeding times need to be supervised. It is not recommended to leave food out as some pets are food territorial and you might not know this until now as your baby approaches the food . Toys should be different form the baby’s so that the pet understands what is theirs and what is the baby’s. However once babies are mobile, many of them truly enjoy playing with and chewing on the pets toys too. This can be challenging for some pets. As some animals act unpredictably around food and toys. Both your toddler and your fur baby need safe zones where they can be alone. Baby gates are an easy way to create a safe area to leave baby on the floor or for the pet to escape form the hair pulling toddler. Crate doors should be left open so the dog has a safe place to escape the toddler and the toddler should be taught to leave the crate alone. Remember your attitude and mood is important during times of transition. Your pet and baby will take verbal and non-verbal cues from you. Supervise all baby and pet interactions for as long as needed. Praise good behaviors and mimic the behaviors you are trying to encourage. Babies love pets and having a pet is a huge life event for a child. Let’s teach nurturing, playing and responsibility. 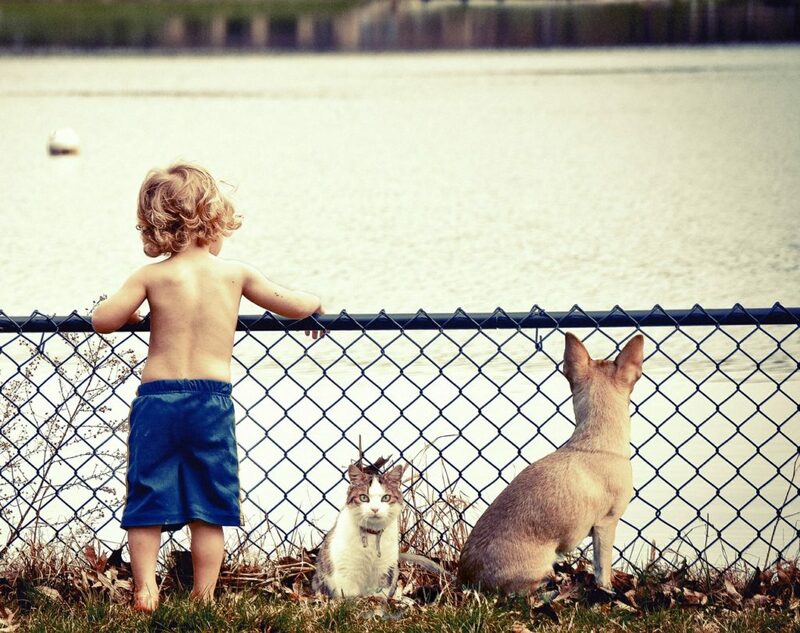 Studies show that exposure to pets and other children help to develop immunity and reduce allergies.